We take a step away from Western comics to cover the final arc of a manga called BLEACH! 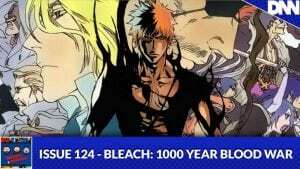 The canon of the Bleach manga has been adapted into anime you can watch (or listen about it on Animation Destination Episode 152!) but the final story arc was unfortunately not animated. So if you’re a Bleach fan or just wanna hear about something new, listen in to the 1000 Year Blood War Arc on Bagged & Bearded!